Perhaps it was more than a coincidence that the Starfish Project decided to base its courses at the Boship Farm hotel at Hailsham, which also happens to be the meeting place of the Rotary Club of Hailsham. 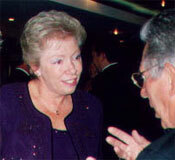 From a first invitation to talk to the club a close friendship grew. Starfish were delighted when Hailsham Rotary decided to mark the centenary of Rotary International with a bursary fund to Starfish. This fund has enabled young people, of limited finances, to attend the course. Starfish involvement with Rotary has grown over the years with talks to many clubs, this resulted in an invitation to talk to District 1250 conference in Jersey, the success of that presentation has since led to invitations to talk to many more clubs and other district conferences and to RIBI conference at Bournemouth, April 2010. We are so pleased to have the chances to talk to so many rotary clubs. This increases public awareness of stammering and the work of the project, whilst also providing the fantastic opportunity for people recovering from stammering to make these presentations and do something that would have been impossible before coming to Starfish. We would also like to say an enormous thank you to the various clubs and individual Rotarians who have made generous donations to the Starfish Project to enable people who stammer, with limited finances, to attend the Starfish course. You are truly helping us to make a difference. If your club would like someone from the Starfish Project to come and talk about the work of the Project and how we are helping people who stammer then please contact us. 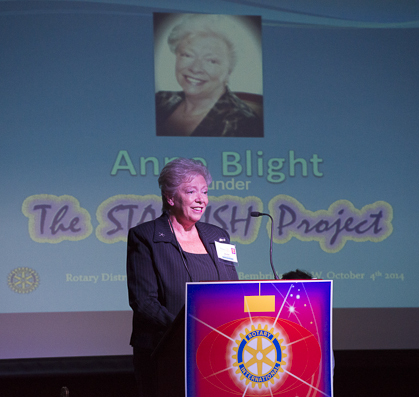 My wife and I have just returned from the Rotary District 1250 Conference on the Isle of Wight and we were delighted to see The Starfish Project on the main platform programme. 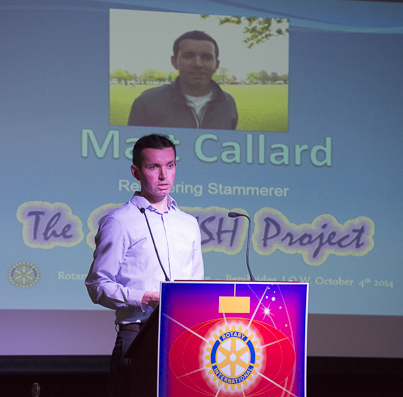 To see recovering stammerer Matthew Callard deliver a succinct and informative presentation in front of an audience of over 300 people again brought tears to my eyes. My wife and I have known Matt since the day he was born. His Mum and Dad having been close friends of ours for more than 45 years. It was around the age of 7 that he developed a stammer and I used to find it very difficult to handle when speaking to him. I would try and finish his sentences or I would move around on my chair nervously and not look at him. It was following his attendance on a Starfish Course in 2006 that everything changed. I was able to start holding a conversation with him. I stopped trying to finish his sentences and I allowed him time to reply to me. He practiced long and hard using the special breathing [costal breathing] technique that he had learned on the 3 day Starfish Course - and gradually over the years Matt has developed his speech without stammering. To get up in front of a large audience and make a presentation requires considerable practice. To do this without a script demands more. To do this having conquered a speech impediment is remarkable. My wife and I have been visiting Starfish Courses for the last 4 year/5 years and we are amazed and overjoyed to see people who have suffered with a stammer suddenly being able to say their name and address and being able to engage in conversation. We know this not a cure and it does require dedication to practice and practice the costal breathing technique that Anne Blight and her team of recovering stammerers teach on the Starfish Course. We shall be visiting Starfish again in 2015 and looking forward to seeing another group of individuals start to change their lives for ever. I cannot thank you and Craig enough for speaking at the RIBI Conference last week - your presentation was undoubtedly the highlight of the whole weekend - everyone is talking about it. The work you do to help people with stammers is quite outstanding and the difference you make to their lives cannot be underestimated - you work miracles. Craig, of course, has overcome mountains to reach the position he is in now, and he also has a natural ability to connect with an audience - there was hardly a dry eye in the house. Everyone was willing him to do well and the spontaneous standing ovation he received was an expression of the admiration and respect felt for the enormous difficulties he has overcome. We have no doubt that such an outstanding young man has a wonderful future ahead of him. Please pass on our thanks and congratulations to him. 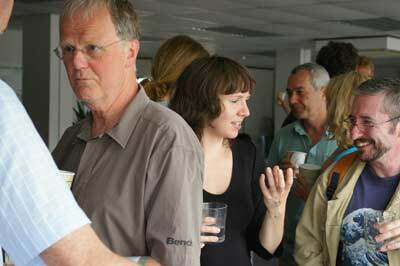 Many, many thanks once again for your contribution to our conference, and we wish you continued success in all you do. In due course Judith and I realized that the two hours we had expected to stay were quickly over but we had no hesitation in agreeing that we wanted to stay for the rest of the day and, indeed, the rest of the course. We were well and truly hooked. Unfortunately Judith could not attend on the Thursday as she had an important Inner Wheel District Meeting which she could not miss but luckily I was able to attend all three days, from nine in the morning until after six in the evening. I am not ashamed to say that my eyes were brimming over for most of the time we spent in the company of all those wonderful people - the inspiring Anne and David, the selfless returners and the brave attendees. We shed tears of sympathy for the initial efforts of the stammerers to utter a few words and the tears of joy when they blossomed and freed themselves from the restraint of stammering. I mentioned that the attendees were instructed to smile. Most found this difficult at first as they concentrated on the other disciplines. However it was heart warming to see the smiles start to appear well before the first day was over when they realized that "yes, we can do it!". From the conference programme you may have thought that the presentations were going to be unremarkable. Just not so! Mike Parry had arranged an interesting and different range of speakers. Top marks must go to the Starfish Project which was founded nearly 13 years ago. This non profit making project runs courses to train people who stammer with a technique that allows them to control their stammer. Donald Sellars suffered from a debilitating stammer all his life until he went to the Starfish Project 10 years ago. Using the project's therapies he has been able to realise and maintain a level of control over his speech that he had given up hope that he could ever achieve. He spoke to us for about 40 minutes without stammering once and it was so moving that we gave him a standing ovation. An amazingly brave man.